TYSA’s opioid workgroup, comprised of individuals from Staten Island Borough Hall, New York City Department of Health and Mental Hygiene, hospital officials and treatment providers, decided to concentrate on this dangerous development. To combat overdoses in Staten Island restrooms, TYSA is creating a campaign to educate business owners on bathroom safety procedures to help protect customers, and train them on what to do if a situation like this arises in their businesses. Based on a successful campaign by the Boston Public Health Commission, TYSA is reaching out to business owners with materials aiming to educate three groups: the business owner, employees and individuals with substance use disorders. 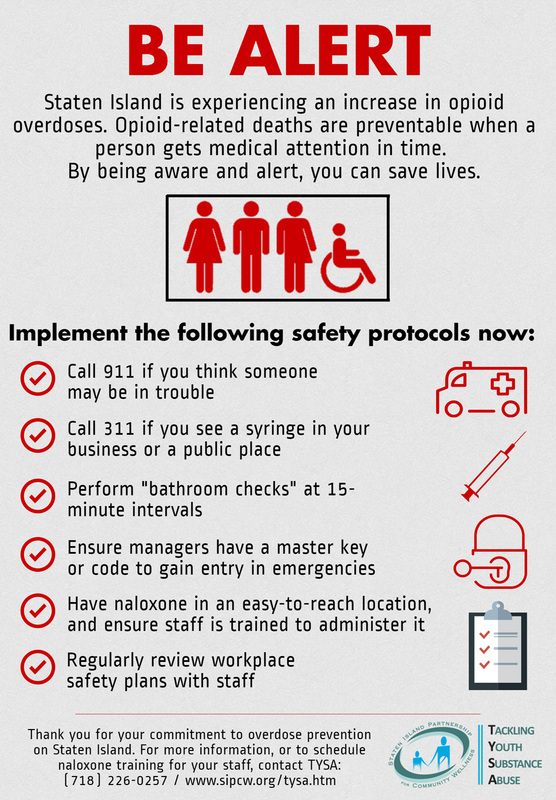 Business owners will receive materials on best practices in staff training, information on Narcan training and administering the treatment, and warning signs for opioid overdoses. Employees will be targeted with a break room poster, with reminders about safety procedures and bathroom checks. Finally, a poster with information about opioid treatment and resources will be provided for the back of restroom doors and stalls, directly reaching individuals potentially living with a substance use disorder. All of these materials are currently in development, along with an outreach strategy. While businesses in high risk areas will be targeted for training first, we encourage every business owner on Staten Island to reach out and sign up to take part in this campaign. Today, on International Overdose Awareness Day, we strive prevent more overdoses from occurring by spreading awareness and ending the stigma. The more we understand the better chance we have to save our neighbors’ lives and prevent a tragedy in our businesses and communities. For information on this campaign, or to sign up to receive materials or training, contact TYSA at 718-226-0258.